Introducing a NEW Owner Benefit: Community Solar! In partnership with Delaware River Solar, we are offering community solar as a new benefit for our Co-op owners. Community Solar allows both homeowners and renters to easily participate in solar, regardless of their ability to install a solar array on their own property. With every sign-up, GreenStar receives a subscription fee, which will provide capital for our expansion. So, it’s a win for you and a win for your Co-op! Delaware River Solar (DRS), based in Sullivan County, is building a community solar farm in Dryden. DRS is a solar development company focused on building community solar projects in New York State. Their community solar farms bring green, renewable energy to residents and businesses while saving them money on their electric bills. “Referred By or Referral Code” line on the sign up form. 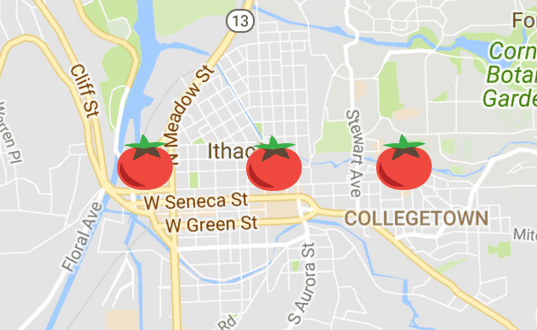 Join us in growing solar in Ithaca! Read our latest blog post about this awesome opportunity! Co-op owners subscribe to a percentage of the solar farm based on their electric usage. The DRS solar farm generates electricity into the local grid, producing bill credits which are distributed to subscribers. Each month, you’ll receive credits on your electric bill, reducing your electricity charges overall. Homeowners, renters, and small businesses with an active NYSEG / RGE account (residential and non-demand small commercial) can participate. Participating members must be served by the same utility as the solar farm. If you already have a solar installation on your property that is connected to the grid, you are not eligible to sign-up for this community solar program through DRS. Signing up is quick and simple using the DRS website. In order to receive your $50 GreenStar gift card, please be sure to put GreenStar on the “Referred By or Referral Code” line. You’ll also need your NYSEG account number to complete the sign up form. GreenStar will receive a subscription fee from Delaware River Solar for every Co-op owner that signs up. These subscription fees will help to fund our West End expansion project. Where is the solar farm located? Delaware River Solar is currently building a solar farm in Dryden. If you already have a solar installation that is connected to the grid you are not able to qualify for this program. Even if your solar installation does not supply 100% of your power needs, you are not eligible to sign up for this community solar program. What if I am on budget billing? You will need to change to regular monthly billing for the purposes of this program. A representative from Delaware River Solar will be in our West End store foyer to answer questions on the dates listed below. Delaware River Solar will also be at our Annual Spring Member-Owner Meeting on Thursday, April 25, 5:30 – 8:30 pm in The Space! Bring your questions or a copy of your NYSEG bill to sign-up for Community Solar.